Is it possible to have too many passions? Not according to my grandmother! 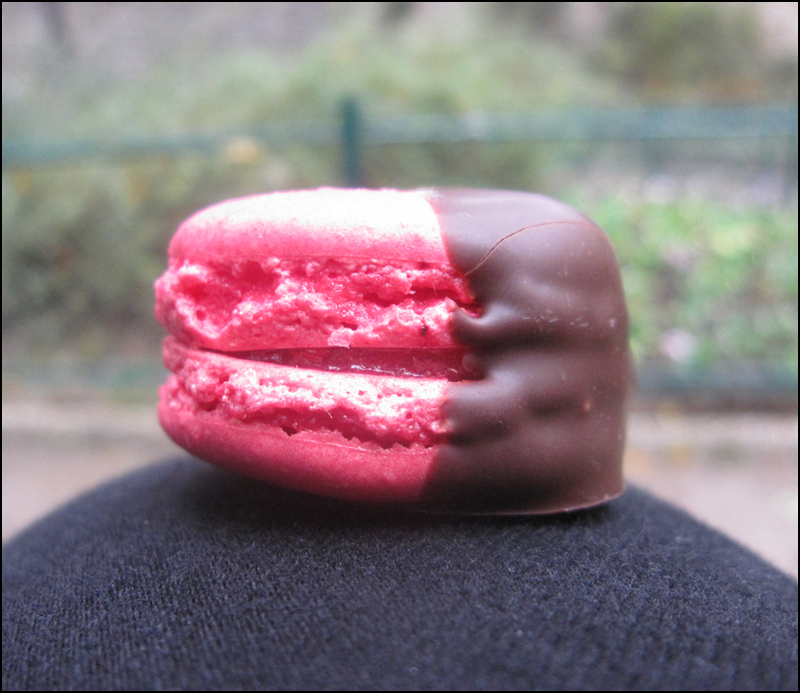 This week, I am happy to sing out that there is a new macaron in the city, and it’s dipped in silky smooth dark chocolate. Created by dream team Christophe Roussel and Julie Haumont, the shop’s Calder-like macaron mobiles in the window called out my name. So I popped inside. The shop’s vitrines and interior are bright and trippy, flaunting a tie-dyed, psychedelic color scheme in purple, pink, orange, and green. Here I definitely felt a mellow yellow-worthy “Groovitational” pull and—in a fit of rave—I purchased one too many macarons to count. Ah, but who’s counting? Soon I was I feeling the sugar push, and singing Simon and Garfunkel’s “Feeling Groovy,” as I skipped down the cobblestones over to my favorite “I Love You” wall, located in the little park behind the swirly Hector Guimard Art Nouveau entrance to the Metro Abbesses. Yes, I am hooked. Rewind! 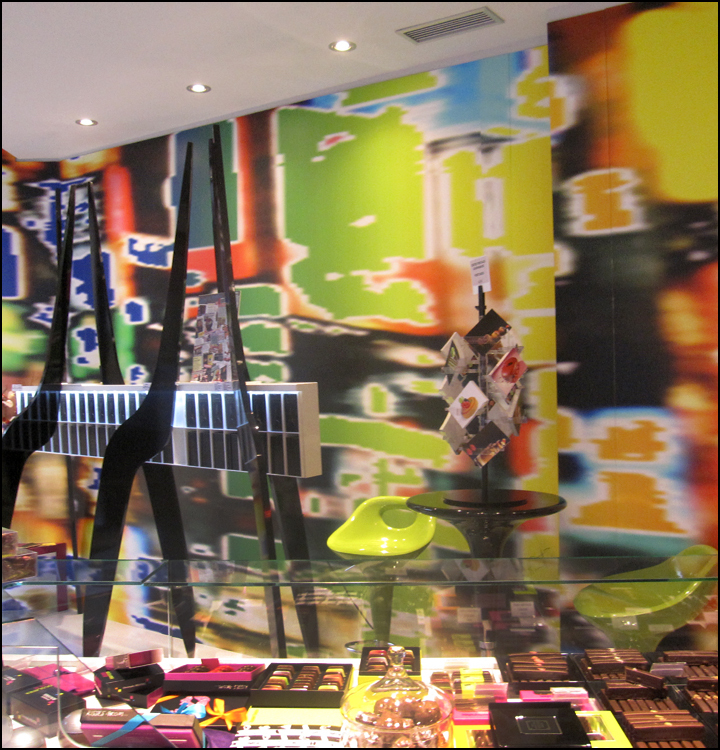 In 2010 Christophe and Julie received Paris’s “Salon du Chocolat Prix Spécial Innovation.” You’ll find their chocolate bar (yes, you heard me right—it’s a bar that serves chocolate) at the Hôtel du Cadran at 10 Champs de Mars in the 7th arrondissement. 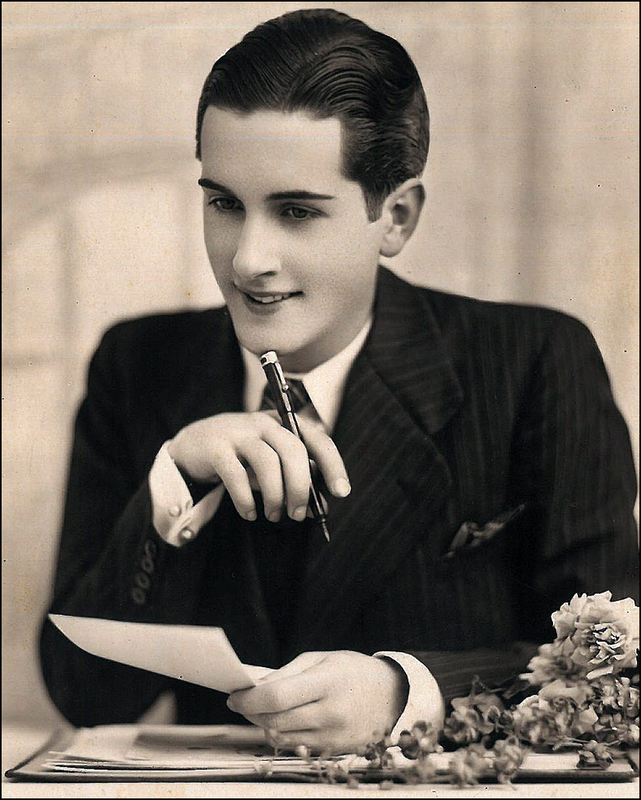 Don’t leave without tasting Roussel’s signature (and Man Ray and Lee Miller-inspired) chocolate lips, or his new chocolate-coated lollipop macarons. Oh, sigh. Also, as you make the rounds in Montmartre, look for street art. It’s everywhere! You can find eye-catching, funky works all over Paris. Most are creatively fun, a few inevitably fall into the category of exquisitely beautiful, but each and every one contributes a little something more to the city’s evolving vistas! I think those macarons could make anything better! They look delicious! Great post! That macaroon looks lovely enough to eat–and I don’t even LIKE macaroons! 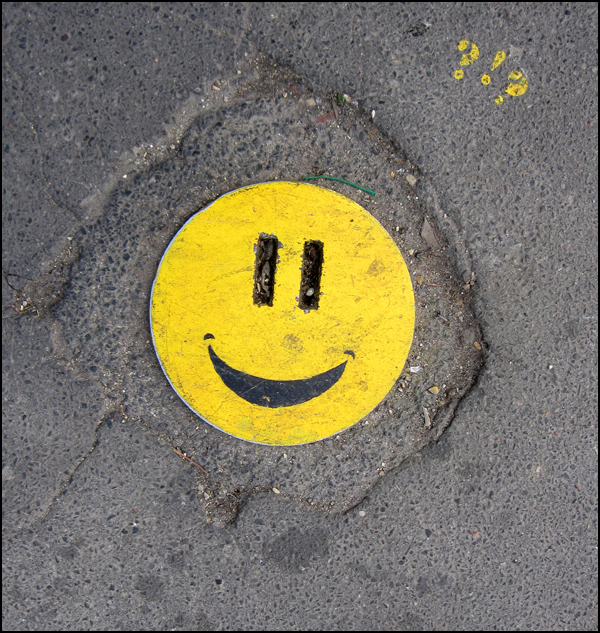 Love the smiley face, too–have you ever noticed the odd little video-game mosaics that appear high on walls and street corners all over Paris? They look a little like the “ghosts” in Pac-Man. What’s up with that? Wonderful post! How I miss the whimsy of the streets of Paris. Love the retro smiley face. Amazing how artistic food can be and how interesting the color mixes are. Nice post. Well I would say that is the perfect reason that I just have to go to Paris! No other reason could be better. Also, space invaders pop up everywhere once you start looking up at street names. I now have to compulsively yell SPACE INVADER whenever I see them 🙂 And what about the casts of different coloured faces in Montmartre, poking out their tongues, closing their eyes? I also fancy Gérard Mulot’s round pretties. Have you tried them? The main bakery and flagship shop are located at 93 Rue Glacière in the 13th arrondissement (Métro Glacière). His other shops are located at 76 rue de Seine, Saint-Germain-des-Prés, 6th arrondissement (Metro: Mabillon) and 6 Rue Du Pas de la Mule, 4th arrondissement (Métro: Bastille or Chemin Vert). Re: the Elsie Wolfe comment: Right on, Elsie!